Can An Improved Way of Sitting Really Help You Eliminate Your Back Pain? Yes, it can! Read the following helpful tips on Correct Sitting and start being kinder to your back. Before long, you will no longer even remember how it feels to have low back pain! Sit up with your back straight and your shoulders back. Your buttocks should touch the back of your chair. All three normal back curves should be present while sitting. A small, rolled-up towel, a lumbar roll, or a back rest can be used to help you maintain the normal curves in your back. Sit at the end of your chair and slouch completely. Draw yourself up and accentuate the curve of your back as far as possible. Hold for a few seconds. Release the position slightly (about 10 degrees). This is a good sitting posture – use this position after shifting to the back of your chair. Bend your knees at a right angle. Keep your knees even with or slightly higher than your hips. (Use a foot rest or stool if necessary.) Your legs should not be crossed. Keep your feet flat on the floor. Try to avoid sitting in the same position for more than 30 minutes. At work, adjust your chair height and work station so you can sit up close to your work and tilt it up at you. Rest your elbows and arms on your chair or desk, keeping your shoulders relaxed. When sitting in a chair that rolls and pivots, don’t twist at the waist while sitting. Instead, turn your whole body. When standing up from a sitting position, move to the front of the seat of your chair. Stand up by straightening your legs. Avoid bending forward at your waist. Immediately stretch your back by doing 10 standing backbends. It is OK to assume other sitting positions for short periods of time, but most of your sitting time should be spent as described above so there is minimal stress on your spine. Use a back support (lumbar roll or back rest) at the curve of your back. Your knees should be at the same level or higher than your hips. 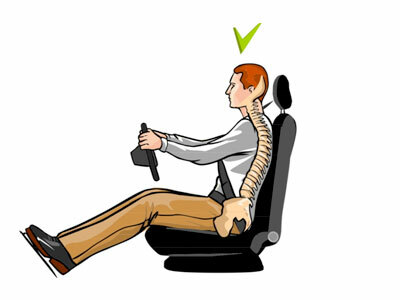 Move the seat close to the steering wheel to support the curve of your back. The seat should be close enough to allow your knees to bend and your feet to reach the pedals. Sitting with a rounded back does several things to cause injury and pain. Rounding forward (slouching) when sitting holds the muscles in a longer than normal position, which weakens them. It also slowly degenerates your discs, the little cushions between your back bones (vertebrae), and pushes the discs outward to the back. This is how discs get herniated (also called a slipped disc). A slipped disc can bulge outward enough to press on nearby nerves, sending pain down your leg. This is called sciatica. This is easy to prevent. Simply sit up straight and DON’T slouch! A good back rest can make this much easier. When you spend most of your waking hours sitting at that work desk, you may want to consider making it a more comfortable space, not only for your short-term but also for long-term health. If you have pain or fatigue in your hands, wrists, arms, shoulders, upper back or neck, it may be related to using a computer. Perhaps you cannot afford to significantly change the work area in your office, but you can probably make small adjustments to promote and proper body mechanics and overall comfort. Without proper computer set-up and use, there are many injuries that may result. Tendonitis is the most common problem, involving tendon inflammation and usually manifests with localized pain in the elbow, forearm, wrist or hand. Bad posture can cause fatigue, muscle strain, and, in later stages, pain. Neck and back pain are also very common complaints and are often brought on as a result of faulty posture over a prolonged period of time. With people spending more and more time in front of the computer there is an increased likelihood of injuries occurring. These can be easily prevented by implementing simple ergonomic changes to your workstation. Avoid pain and remain healthy – learn these tips today! Click here to read your copy of a helpful and informative article on Computer Station Ergonomics created by the Canadian Physiotherapy Association. Do not overlook the importance of a good office chair. Working at a desk for long hours can lead to neck and back pain or carpal tunnel syndrome if your office furniture does not have the appropriate “fit” for you. Look for a chair that has both adjustable seat and armrest heights/widths, offers good lumbar support, and has a firm seat. Ergonomically designed chairs help prevent body fatigue leading to back pain, tension headaches, and carpal tunnel syndrome. 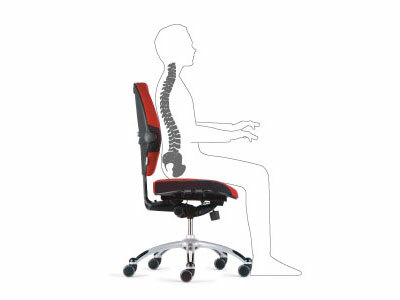 Additional features in a good chair include : seat adjustability, back rest angle adjustability, chair recline and tilt lumbar support/depth adjustability. Once the correct seating has been established, be sure to supplement the general lighting in the room with a task light illuminating the work surface, and take frequent breaks from your computer screen. You will be well on your way to a pain-free, productive work day! Are you on the phone more than one hour a day or while keying or writing? If your phone use exceeds one hour per day, often the handset ends up being used without any hands and is held to the ear with the shoulder. Cradling the phone this way contributes to neck and shoulder discomfort and is a big no-no!